While many state and federal programs exist to combat food insecurity, local-level community initiatives are also working to increase public access to local and healthy foods. Nevertheless, a prime venue for distributing local and healthy foods—farmers markets—primarily serve white, middle- and upper-class consumers. In an attempt to better understand the barriers and facilitators affecting consumer participation in farmers markets, we use the case of participation in a community farmers market in Bloomington, Indiana. Drawing on survey data collected from two neighborhood groupings near the farmers market—one mixed-income and one low-income—we explore behavioral facilitator and constraint concepts associated with food values and farmers market shopping decisions. 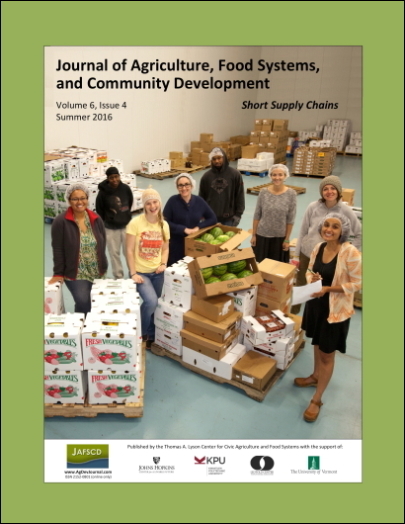 Building on previous scholarship on the dynamics of farmers market participation, our results indicate that perceptions of quality/freshness, and ease/difficulty of transportation to acquire food, are key factors for both the low- and mixed-income individuals. As such, we suggest that local food advocates can best serve low- and mixed-income communities by promoting ongoing community health education efforts that emphasize the importance of fresh, healthy foods, and by facilitating the positioning of small-scale farmers markets in close proximity to such neighborhoods or bringing fresh produce to underserved neighborhoods through the use of mobile markets. 1025 East 7th Street; Bloomington, Indiana 47405 USA; +1-812-856-0969. Department of Geography, Indiana University; Student Building; Bloomington, Indiana 47405 USA. 827 West 14th Street; Bloomington, Indiana 47404 USA.